At his practice in Evans (Augusta), GA, Dr. Chen specializes in revision facelift surgery, which is a facelift after a previous facelift. 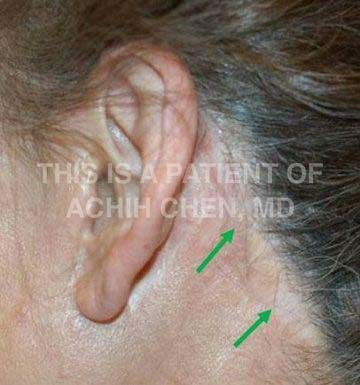 Dr. Chen uses state-of-the-art facelift techniques that leave individuals looking more youthful and refreshed. However, some facelift techniques used by other plastic surgeons may result in an “operated” or “done” appearance with telltale signs of surgery including very visible scars, over-lifted sideburns, distorted earlobes, and disrupted hairlines. In patients who have undergone a previous facelift that has left them with these telltale signs of surgery, revision facelift surgery may be designed to erase these problems while leaving them with a natural, refreshed appearance. 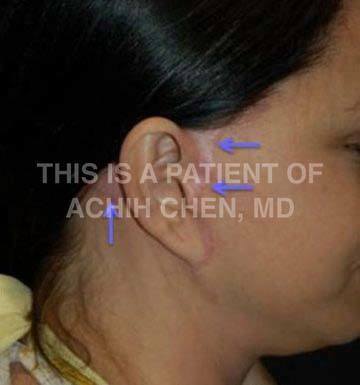 Dr. Achih H. Chen, facial plastic surgeon and revision facelift specialist in Evans who sees patients from the Columbia and Charleston, South Carolina areas, can help you with your unwanted jowls and excess skin in the neck while addressing problems from previous facelift surgery. Request a consultation with Dr. Chen using the online form, or call our office at (706) 210-2625 to schedule an appointment. Facelift surgery is the most effective way to treat the dreaded jowls and loose neck skin. It is a procedure that significantly turns back the clock of facial aging. Unfortunately, the clock of facial aging continues to turn forward even after facelift surgery. As a result, individuals may eventually choose to have a secondary or revision facelift. Additionally, while today’s state-of-the-art facelift techniques leave individuals looking refreshed and more youthful, some facelift techniques may result in an “operated,” “wind-swept,” or “done” appearance. These are signs that are often mistaken as a normal part of facelift surgery. Many people have come to believe that those who have undergone facelift surgery need to have certain unnatural or pulled appearance. Fortunately, facelift surgery is not a compromise choice between a saggy neck and jowls or accepting an “operated” look. For patients who have undergone a previous facelift that has left them with tell-tale signs of previous surgery, revision facelift surgery may be designed to erase these problems while leaving them with a natural, refreshed appearance. 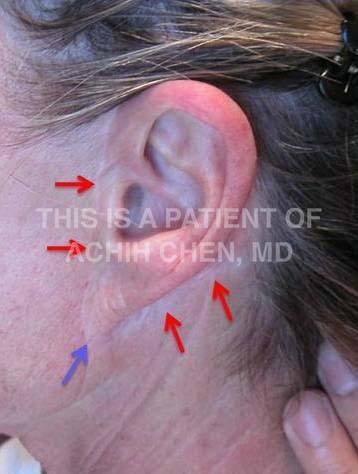 Over-lifted sideburn (temporal hair tuft) from previous facelift surgery (blue arrow), compared to ideal position of sideburn following facelift surgery** (yellow arrow) by Dr. Achih H. Chen. Widened scars following facelift surgery due to excessive tension on the incision lines and too much pull on the skin (blue and green arrows). Both patients had previous facelift surgery at another practice**. **This patient has given consent to use these photos. Revision facelift requires specialized training and extensive knowledge of facial anatomy. Dr. Chen performs the revision facelift surgery to treat the sagging neck and jowls while addressing problems that may have been created by previous facelift surgery to providing a natural, “unoperated” postoperative appearance. Revision facelift can be performed on an outpatient basis here at The Georgia Center. Revision facelift surgery is performed under deep sedation in which the individual is completely unaware of their environment. The postoperative nausea and sore throat that may accompany general anesthesia is usually avoided with surgery performed under deep sedation. Following the revision facelift, a cotton dressing is placed around the neck and face, leaving the central portion of the face uncovered so that the individual may watch television, eat or talk to their family or friends. 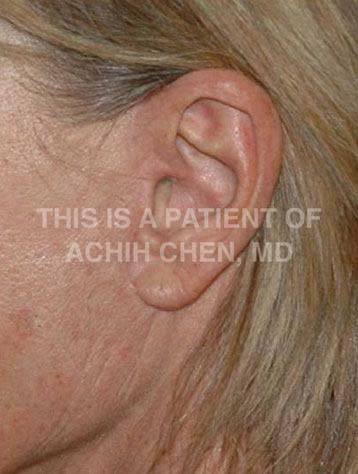 Dr. Achih H. Chen can take years off your face and provide you with a refreshed, youthful aesthetic appearance with a newly restored jawline and neck while addressing problems from previous facelift surgery. You can also combine a revision facelift procedure with other cosmetic treatments, including lip augmentation and eyelid surgery to enjoy a more complete makeover.